Every heroes that came and went during the span of our existence brought upon every effort to preserve everything that holds significance to our species. But then anyone of us can willingly admit that preservation is not always our strong suit. Why? Because most of our means to survive causes harm to everything around us. Even the greatest values that raised us as a race namely science, development, order and civilization brought upon many deaths, abuse to the environment, extinction to some species, destruction, and etc. No matter how hard we try to make good, our primal nature is always all about taking things for ourselves. Conversely, this primal nature is not totally alien to every other species in the animal kingdom. So, we can’t really rule ourselves out as the only villain in the biography of our world. It’s just that, being the most intelligent species as we are, we have the most ability to do the worst. In truth, there is nothing wrong with our means of survival. The damage we often cause has a deserving purpose in behind. We need to supply for our own good. As a matter of fact, our very own taking from nature is part of the balance. But we only need to ensure that we do not tip the scales of natural balance to a point that it is fatal. In fact, most of us would just attempt to take care of the problem on our own. We do not often realise that the wrong methods of dealing with a dead wood can actually cause more harm than good. So, the best approach is to contact a reliable arborist to take care of the problem. Like us, they also age. And this is less fatal for trees, but just like us, they also need proper treatment as they are dying too. Otherwise, they are prone to pests and diseases. The worst catch to it is that often times—especially for some specific species, they do not die immediately and even try to gain new life. As beautiful as that sounds, more often than not, this is bad than good. Trees give us raw materials as means for our survival. And again, there is nothing against that. It’s part of the paradox that we need to ensure that we have our means of control too. But bear in mind, we should never let our own greed be the cause of the greater damage. Because when we do, especially if we do not really have the adequate knowledge on how to harvest properly, we can cause its damage. How to Tell When A Tree Is Dying? If there’s a tree in your yard that is not how it used to be, like its losing its vitality e.g. lost its colour, branches are more fragile, etc., reassess its condition. There is a great possibility that it is dying. However, you can confirm whether this is true by looking into more symptoms of a dying tree. Decolourisation of leaves is natural according to the season. Otherwise, then your tree is showing signs of poor health. Once you start seeing this symptom and many more, contact a reliable arborist immediately to perform dead wooding service. Well, this is apparently the next step to dying leaves. They fall and eventually die out. If you notice this happen in a vast region of your tree especially when it’s off season, then it’s a strong indication that it is dying. After years of dead wooding service, we noticed fungi is always the most common indicator of a dying tree. Because by itself it can be considered as a disease and needs to be cured immediately. A damaged branch is mostly where dead wooding service is applied. It gets more obvious as more and more branches keep falling off randomly from your tree. Immediate dead wooding service is highly recommended especially if this occurrence becomes a usual thing. It poses a great danger to your property and everyone around it. A damage on roots can affect the overall physiology of the tree. If the said damage has been there for a long time then more likely, it’s already killing your tree. It gets even trickier since most of the roots are submerged underground. Taking care of your trees is apparently an act of preservation of life. And although it is established that we are bound with a paradox which is part of nature, it is our responsibility to make efforts to make amends to our environment. 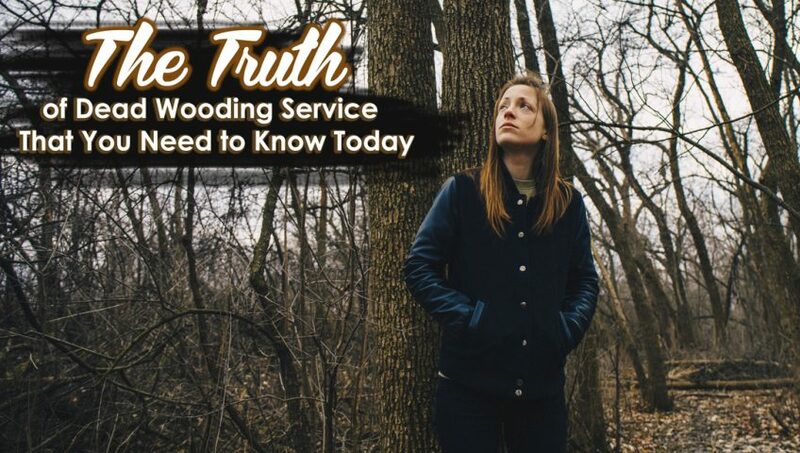 You can start by making sure that the right processes such as dead wooding service are done to your dying tree. After all, trees hold too much significance to us as species to be disregarded. And not only to us but to every living form in the world. Did this article bring you a better understanding? Learn more of what we do and browse through the services that we offer. Also, check out more blogs and find more value in what we do. You can also talk to our friendly staff and call us now. And if you are interested in pruning and wants to know more about it. You can check out our post: 5 Tree Pruning Benefits That You May Haven’t Thought About.